Here are some resources that are available online, either via this website or others. These used to be two separate commemorations – that of Br. Jaime Hilario, and that of the Brother Martyrs of Turon. They are now commemorated together on the same date. 1) There is a video about Br. Jaime Hilario and a video about the Brother Martyrs of Turon that were done by Mr. Ed Sirois for his school community. 2) There is a book that provides the story about the lives of these martyrs. 3) Further online information and links may be found at Wikipedia about Jaime Hilario and about the Martyrs of Turon. 4) Various kinds of artwork are collected about Br. Jaime Hilario on this Google Photos album and about the Brothers Martyrs of Turon on this Google Photos album. 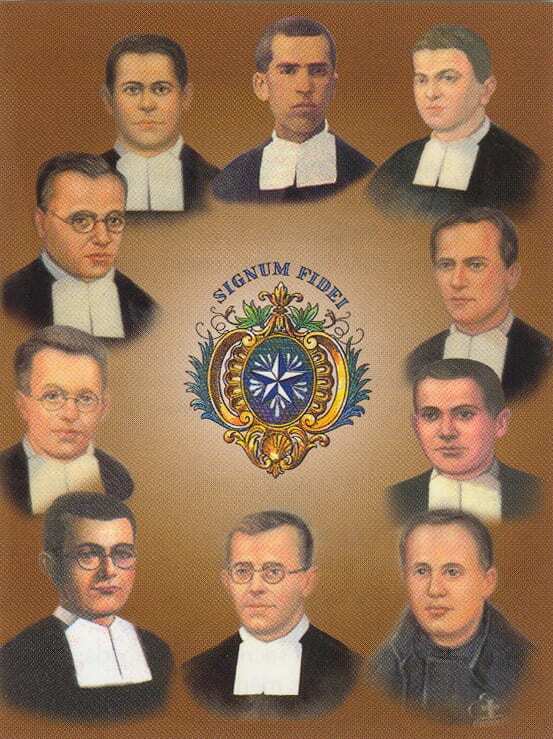 5) Their stories are included in a small PDF booklet about all the Lasallian saints. 7) The Motherhouse in Rome has provided a PDF with the liturgical (Mass) readings and prayers for this Lasallian feast, a webpage about Br. Jaime Hilario, and a webpage about the Brother martyrs of Turon. In 1934 Turón, a coal-mining town in the Asturias Province in Northwestern Spain, was the center of anti-government and anticlerical hostility in the years prior to the outbreak of the Spanish Civil War. The Brothers’ school was an irritant to the radicals in charge of the town because of the religious influence it exerted on the young. The Brothers were known to defy the ban on teaching religion and they openly escorted their students to Sunday Mass. On the First Friday of October, the authorities broke into the Brothers’ house on the pretext that arms had been hidden there. Father Inocencio, a Passionist, who had come the night before, was preparing to say Mass for the Brothers. They and their chaplain were arrested, detained over the weekend without trial, and then in the middle of the night were marched out to the cemetery where they were summarily shot. Brother Cirilo, the Director, was 46 years old and Brother Marciano, the cook, was 39. Brother Julián was 32 and all the rest were in their twenties. Aniceto, the youngest at 22, was still in triennial vows. They were arrested, detained, and executed as a community, victims of the hatred and violence against the Church, witnessed by their death to the faith they so courageously professed and so effectively communicated to their students.